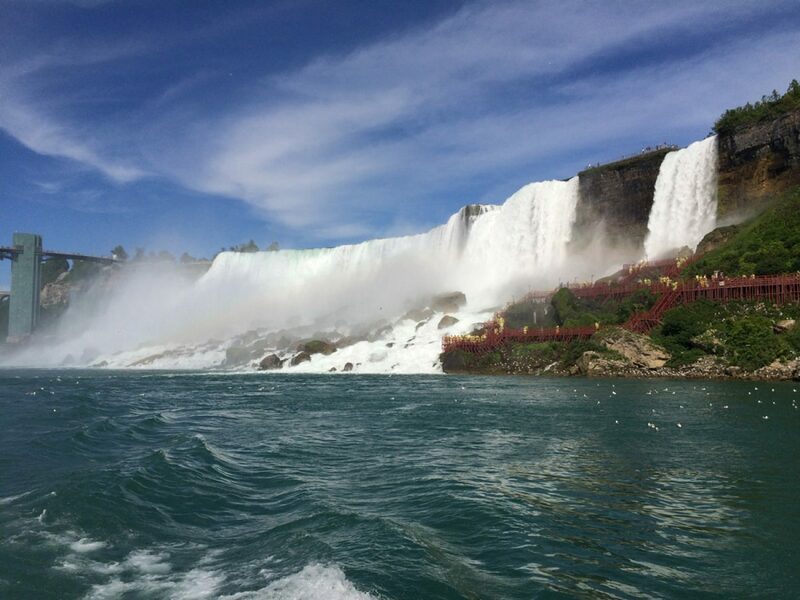 We totally forgot to mention in our post about our stay in Rochester that we also drove to Niagara Falls one day! Although it is very touristy, it was definately on our list of places to visit. None of us had ever been there before so it was super fun to have that experience together. We were shocked that at the top of the falls - it was so quiet. The water just fell off with out a sound. It was almost creepy how quiet it was. We got our tickets for the Maid of the Mist and Cave of the Winds and were ready to get wet! First up, Maid of the Mist. You're packed on a large boat with a bunch of people (not too croweded) and they take you to the bottom of the falls. Prepare to get a little wet! There was so much mist it was hard to get a good shot of it, plus I really just wanted to watch it and experience it with the kids. Sometimes you need to just experience things and not take pictures. Even though they gave us these sweet blue ponchos you still get a little bit wet on the boat. The view was amazing. The sound so intense. The experience was unforgettable. They kids loved seeing all the birds on the edge of the rocks, but we didn't get any pictures of them. Then came Cave of the Winds. Wow! That was probably our favorite thing about the whole day. We saved that for last because we knew we would be wet. We kept seeing people walking around with their special shoes and soaked pants so we knew that had to be at the end of our trip. It was so awesome to walk up right beside the water fall and feel the pressure wash over our feet. It was so cold and I remember thinking how crazy it was that they were able to build these decks right next to the falls. Once you got all the way up to the top you could stand right at the edge of the deck and get pounded with the falls. Jon got to do it but I had Jax who was super nervous and wanting to get out of there ASAP. I still regret not standing there and having the experience of the falls wash over me. Next time, for sure!! It was beautiful and something we will never forget.